Well, a few final thoughts on the Reds draft class. 1) First, Yasmani Grandal. I touched on Grandal before the draft and my position remains unchanged. He simply didn't seem to be the best value on the board at that point. The main reasons are related to both his performance and his position. I agree with the philosophy that you take the best player available in the first round, regardless of position. However, I do think positional value HAS to be considered. Catcher is a premier defensive position and when you can add an impact bat at a premier defensive position, then you are potentially gaining a significant advantage over the competition. When determining a player's value, you have to have a basis of comparison, then you can determine how far above or below that established benchmark a player may be. Typically, you see a player compared to league average or replacement level. Regardless of the specific benchmark, an above average catcher cannot have the same impact as an above average player at another position, as the catcher position has inherent playing time limitations. In the NL, catchers are going to play only ~135 games, at most. In the AL, where teams have the benefit of the DH, a catcher with a plus hit-tool can contribute at DH on days when he isn't behind the dish. But, in the NL, if you have a catcher who is 25% above replacement level or league average, then he is undeniably valuable. That said, the playing time limitations mean that he won't have the same impact as a player at another position who is 25% above above average or replacement level. The other player will simply be able to provide his +25% production over many more games. Additionally, the development path for catchers is significantly more perilous than for other positions. Catchers have more to learn on both sides of the game and can also get nicked up more easily than other players. As a result, there is more inherent risk in the catcher position than other non-pitching positions. So, I think you have to factor in the higher level of risk in making your first round selection. Grandal has some impressive attributes, including switch hitting ability, plus on-base skills, and a potentially solid hit tool. However, when you factor in the inherently lesser impact of the catcher position, the higher level of development risk, and the lingering questions about both his bat and glove that I touched on in my pre-draft write-up means that Grandal is unlikely to be the best option at that point in the draft. Personally, I have a hard time justifying passing up both college lhp Chris Sale and high school outfielder Josh Sale, both of whom were still on the board when the Reds selected Grandal. Chris Sale was one of the leaders in the nation in both strikeout rate and walk rate. He had a strong combination of stuff and polish. As for Josh Sale, Baseball America rated him as having both the best power and the best plate discipline in the entire high school draft class. One scout was quoted as saying that Sale had the best bat speed he had ever seen in an amateur. Josh also has plus make-up and a strong work ethic. Josh Sale might be the type of bat that, in hindsight, makes everyone wonder how he slipped so far down in the draft. Grandal certainly has value, but from where I sit there were other players on the board that provided better value and more upside. Unless you have a catching prospect of the Joe Mauer, Matt Wieters, or Buster Posey class, then I'd have a hard time selecting a catcher with a first round pick. It's difficult to add true impact talent to the system, but the first round pick represents the best opportunity to do just that. I'm just not sure Grandal is the best option for doing so. 2) While I'm not wild about Grandal in the first round, I love LaMarre in round 2. LaMarre was someone I wrote up in my pre-draft list of guys the Reds should target. I'm quite surprised that LaMarre slid to the Reds in the second, but I'm ecstatic that he did. LaMarre has potentially five above-average tools, a high baseball IQ, and a hockey player mentality. LaMarre signed quickly and has already made his debut for low-A Dayton. Some question whether LaMarre can stick in centerfield, but I think he has the speed and instincts to handle it just fine. To me, LaMarre represents very good value in the second round. For better or worse (probably for better most of the time), it's unusual that the Reds actually draft someone I'd like to see them draft, so LaMarre is a pick that I really liked. 3) In rounds 3 and 4, the Reds nabbed a couple of collegiate middle infielders. They selected junior Devin Lohman in round 3 out of Long Beach State. Lohman bats right and throws right, also stands 6-2 and 195 lbs. For the Dirtbags, Lohman hit .404/.471/.550 with 1 homer and and 7 steals in 15 attempts in 40 games. On the season, he hit only 1 homerun, but did manage to collect 17 doubles. Still, it is questionable how much power he'll have in the professional ranks with wood bats. In round 4, the Reds grabbed Brodie Greene out of Texas A&M. Greene was a senior in 2010, bats right, throws right, stands 6-1 and weighs in at 195 lbs. Greene had very strong production for the Aggies, posting a .395/.462/.673 with 14 homeruns, 23 steals in 28 attempts, and a 31/24 K/BB ratio in 65 games. He has played both secondbase and shortstop at the collegiate level, but he obviously gets a boost in value if he can stick at shortstop. However, the bat has potential for a middle infielder. Overall, it was a down draft class for MLB, but the Reds did manage to grab a few interesting prospects. The 2011 draft class is reported to be stacked with talent, but the Reds still have managed to grab a few prospects that may play significantly roles in the organization in the future. 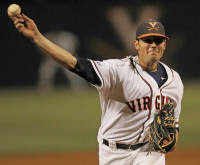 "In the 10th round of the 2010 Rule IV draft, the Cincinnati Reds select Kevin Arico, pitcher, University of Virginia." Arico stands 6-4, weighs in at 215 lbs, and throws from the right side. He's got a good, strong build and room for additional physical projection. The Reds selected him as a junior, but Arico still had enough time to put together a nice collegiate career for the Cavaliers. In 28 games in 2010, Arico had a 1-1 recod with a 2.51 ERA, and a 42/8 K/BB ratio. He had 18 saves on the year, which was tops in the nation. His performance was enough to earn him a selection to the 2010 NCBWA All America Team. His performance helped the University of Virginia get deep into the Super Regionals. I had the opportunity to watch him work in the deciding game against the Oklahoma Sooners. In that game, Arico worked exclusively with a fastball that sat in the 88-90 range (though, I'm not sure he even got into the 90s in the Sooner game) and a slider that sat in the low 80s with downward bite to it. He leaned heavily on the slider, which is easily the better of his two offerings, but that may ultimately speak more to the quality of his fastball, than the impressiveness of his slider. Still, the slider is a good pitch. It sat in the 80-83 range with downward tilt to it and Arico consistently worked the outside corner with it. The Sooners made a lot of contact against Arico, even if it wasn't consistently hard contact. The Sooners had a few seeing-eye singles and Texas Leaguers, but they did hit a couple balls hard. Arico's fastball didn't have enough velocity or movement to keep anyone honest, so they focused on the slider. As a result, Arico didn't get many swing-throughs on his pitches. He did get a called strikeout on a well placed fastball on the inside corner to a righthander. He was ultimately chased from the game on a three-run homer to lefty Cody Reine after runners had reached on an error and a hit by pitch. Mechanically, Arico is sound. He's a bigger guy, so he's got longer limbs to keep in sync. The longer limbs also gives him some length to his arm swing and delivery, but also a bit more leverage to his arm action. He also uses a slower tempo in his delivery. He has a nice high leg kick and little wasted movement. He gets his arm up into proper throwing position at the right time and uses a high three-quarter arm slot. The lower arm slot negates some of the benefits of a being a taller pitcher, but overall Arico has a nice combination of physical build and clean mechanics which should give him additional projected upside. Overall, Arico seems like a solid value in the 10th round. In the limited action I've seen, 11th rounder Drew Hayes and 10th rounder are similar prospects. Kevin Arico undeniably had the better collegiate career, but Hayes seems to have the better stuff. As a result, Hayes might be the better professional prospect. Regardless, both are going to need to improve their respective levels of performance to find success at the MLB level, whether it's through increased velocity, a new pitch, or improved command. But, that's what the minor leagues are all about, developing players. Hayes is a college senior at the University of Vanderbilt who the Reds landed in the 11th round of the 2010 draft. He's a jack of all trades type pitcher, working in relief or spot starting as needed. He stands 6-0 and weighs in at a stout 212 lbs and throws from the right side. I was able to watch Hayes today working against Florida State in the Super Regionals. He featured a four seam fastball that sat in the 90-94 range without much movement. He also threw a changeup that sat in the low 80s. He also used a power slider with downward bite that clocked in the mid-80s and what looked like a curveball that was in the 74-75 mph range. Overall, the stuff was far from overwhelming, but was solid-average and the fastball velocity wasn't bad. Hayes' fastball command was inconsistent, but he seemed better at spotting it to the thirdbase side corner of the plate than to the firstbase side of the plate. That seemed to be the case against both left and righthanded hitters. On the plus side, he effectively mixed his pitches and seemed comfortable throwing any pitch in any situation. In the Sunday elimination game against FSU, he worked 4.1 innings, giving up 4 hits and 0 runs with a 3/4 K/BB ratio. The first time through the order he started the hitters off with the fastball and worked the offspeed pitches off the fastball. The second time through the order he started hitters off with the offspeed pitches and turned to the fastball as an out pitch. So, he did demonstrate polish in his approach. On the season, Hayes posted a 4.25 ERA with a .226 batting average against in 48.2 innings. He tallied a 46/22 K/BB ratio and a 6-0 record with 5 starts and 23 appearances. Right now, he gets himself into too many jams, even if he does have some success wriggling out of them. However, more advanced competition is much less forgiving, so that approach won't work as he advances in the professional game. As for his mechanics, they are fairly clean with the only red flag being a higher than desirable back elbow in relation to his shoulder. That could raise his risk of injury a bit, but it's not extreme and would be even less of a potential problem if he works in relief. Overall, Hayes seems like a solid pick in round 11. He doesn't offer plus stuff or plus command or an impressive track record, but seems fairly solid across the board. However, there doesn't seem to be much projection left in his game, which is problematic in that his current level of performance didn't even allow him to dominate against collegiate competition, so he'll need to find improvement somewhere to succeed against more advanced competition. Whether that comes in the form of increased velocity or increased command or both, he'll need to take his baseline level of performance up a notch. Still, he's not a bad value in round 11. Here is a list of all players drafted by the Reds, courtesy of Baseball America. 1 12 Yasmani Grandal C Miami Fla.
2 62 Ryan LaMarre OF Michigan Mich.
3 94 Devin Lohman SS Long Beach State Calif.
5 157 Wes Mugarian RHP Pensacola (Fla.) Catholic HS Fla.
6 187 Drew Cisco RHP Wando HS, Mt. Pleasant, S.C. S.C.
7 217 Tony Amezcua RHP Bellflower (Calif.) HS Calif.
8 247 David Vidal 3B Miami Dade JC Fla.
9 277 Tanner Robles LHP Oregon State Ore.
10 307 Kevin Arico RHP Virginia Va.
11 337 Andrew Hayes RHP Vanderbilt Tenn.
12 367 Kyle Waldrop OF Riverdale HS, Fort Myers, Fla. Fla.
14 427 Daniel Wolford RHP California Calif.
15 457 Stephen Hunt LHP South Florida Fla.
16 487 Rob Kral C College of Charleston S.C.
17 517 Brent Peterson SS Liberty HS, Bakersfield, Calif. Calif.
19 577 Josh Alexander OF Mountain Pointe HS, Phoenix Ariz.
20 607 Chris Berset C Michigan Mich.
21 637 Josh Smith RHP Lipscomb Fla.
23 697 Randy Fontanez RHP South Florida Fla.
24 727 Patrick Doyle RHP Missouri State Mo. 25 757 Dan Renken RHP Cal State Fullerton Calif.
29 877 Adam Muenster 3B Kansas State Kan.
30 907 Brad Hendrix RHP Auburn Ala.
31 937 Dominic D'Anna 1B Cal State Northridge Calif.
32 967 Jaren Matthews 1B Rutgers N.J.
33 997 David Garner RHP Niles (Mich.) HS Mich.
34 1027 Brandon Dailey SS Johnson SS, Brantford, Ont. 35 1057 Tyler Wilson RHP Virginia Va.
36 1087 Chuck Ghysets RHP Lincoln Trail (Ill.) JC Ill.
38 1147 Matt Leonard LHP Cal Poly Calif.
40 1207 Lee Orr OF McNeese State La. 41 1237 Jonathan Kaskow 1B Stanford Calif.
42 1267 Mitchell Hopkins LHP Louisiana State-Eunice JC La. 43 1297 Matt Campbell RHP Florida Fla.
44 1327 Eddie Campbell LHP Bridgewater Raynham HS, Bridgewater, Mass. Mass. 45 1357 William Harford C Notre Dame Ind. 46 1387 Patrick Quinn RHP St. Petersburg (Fla.) JC Fla.
49 1477 El'Hajj Muhammad RHP CC of Morris (N.J.) N.J.
Well, time for the guys that jump out at me and that I'd like to see the Reds target. Here are the players that I'm really high on. I've already done full write-ups on the top two guys, in order, on my list: Chris Sale and Austin Wilson. Obviously, I'd rather have Bryce Harper or a couple of other guys, but these are the top two realistic options on my board. I really like both Sale and Wilson and would be thrilled with either. Unfortunately, Sale is likely to be off the board by then and Wilson will be a tough sign, especially since the Reds are frequently hesitant to exceed Major League Baseball's slot bonus recommendations. That said, here are a few other guys whose name I'd love to see the Reds call during the draft. I like Reggie Golden.. a lot. He stands only 5-10, but weighs in at a muscular 210 lbs. He bats right and throws right. Golden is a potential 5-tool talent and, as a result, he has a very high ceiling. He's got strength and speed to spare. His athleticism rivals that of any player in the draft. But, of course, when you are talking about a player with strong athleticism, you frequently are talking about a player who is raw and lacks polish, which is certainly the case with Golden. Golden is a bit raw at the plate, but I love his swing mechanics. He has a nice, quiet pre-pitch setup, loads up well, and doesn't get cheated at the plate. He fires the hips well and generates significant bat speed, which gives him good power production. He needs to continue refining his pitch recognition, but his swing mechanics are strong and give him significant offensive upside. In the field, he is likely to be relegated to the corner outfield spots. He has above average speed, but needs to improve his routes to the ball to more effectively use his speed in the field. His arm is solid, but not a big strength to his game. Still, with additional development he could become an asset on defense and certainly wouldn't be a liability. Golden fits the profile of a high risk, high reward high school talent. His upside is tremendous, but his downside risk is also substantial, as baseball is not always kind to those with great athleticism. Golden would be a reach with the #12 overall pick, but if he's there when the Reds pick in round 2, then they should jump all over him. Unfortunately, the Reds second round pick is #62 overall, as there are a substantial number of picks in the Supplemental Round. However, using their first two picks on Austin Wilson and Reggie Golden would give the Reds two toolsy outfielders with massive upside. Golden just needs more experience to improve his impressive tools, but his upside is tremendous. LaMarre is a standout for the Wolverines who is hitting a robust .419/.453/.649 with a 20/5 K/BB ratio and 6 hit by pitches. Obviously, his walk rate leaves something to be desired, but he has flashed better plate disciplined in the past, so this could be a sample size issue. Additionally, LaMarre broke his thumb diving for a flyball, which cost him playing time, as well as hand strength when he finally returned. He stands 6-2 and weighs in at 206 lbs, bats right, and throws from the left. He also offers some of the best athleticism in the collegiate ranks. He has a quiet set-up and has fluid swing mechanics. He generates good bat speed and gets good extension, which when coupled with the loft he gets on the ball should give him above average power in the future. He also has good plate coverage and hits effectively to all fields. LaMarre has a sweet righthanded swing that makes him an intriguing hitter. LaMarre also has good speed. He uses a long stride, which limits his first step quickness, but also enables him to chew up the ground when he gets up to speed. He is a strong defensive outfielder who can handle all three spots effectively. He is a legitimate defensive centerfielder and an intriguing overall prospect. In addition, LaMarre has the type of intangibles that should make his overall game better than the sum of the individual parts. He has plus make-up, a strong work ethic, and a gamer mentality. 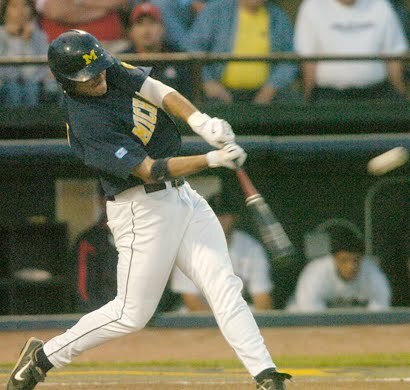 In the past, the Reds have had a lot of success with University of Michigan Wolverines, including such names as Barry Larkin, Chris Sabo, Hal Morris, and others, so LeMarre could be the next in a long line of Wolverine talent. Overall, LaMarre is the type of well-rounded prospect that I'd love to see the Reds land in the draft. He's a nice blend of tools and skills, upside and polish. The fact that he also plays a premier defensive position and plays it well gives him nice total value as a prospect. While I typically prefer a well-rounded prospect, it's difficult to overlook Sale's "hit tool." Sale offers some of the best bat speed in the entire draft. In fact, it has been compared favorably to that of uber-prospect Travis Snider, who is one of the best young hitting prospects in the majors. Sale's value is driven largely by his bat, as he lacks foot-speed, his defense is league average at best, and his positional value is negligible, as he'll be relegated to leftfield or rightfield. So, his bat will determine his career path. At the plate, Sale's set-up reminds me of Brad Fullmer. But, his swing mechanics are strong and his lightening quick bat generates massive power. He has the type of impact bat that any system can use and would look great in the Cincy system. He'll need to tighten up his swing to close some holes. If he can do so, then he'll be able to hit for average as well as power. If not, then he may struggle with contact and may never hit for average. Sale also has great intangibles. He has a strong work ethic and make-up, which should allow him to make the most of his impressive hit tool and limit the drag on his value created by his below average speed and defense. Overall, Sale is very impressive hitter. His other skills are league average at best, but his hitting ability should more than make up for it. Sale would be a great add to the Reds. Unfortunately, Spence hasn't thrown a single pitch in anger in 2010. He was drafted in the third round of the 2009 draft by the Angels, but he decided to turn it down and return to Arizona State. That decision may come back to haunt the Australian, as he suffered "arm soreness." He reportedly has soreness where the elbow and forearm connect, but no structural issues. At this point, Spence is a real wildcard, but he offers the type of value that *could* make him a sneaky good pick in the middle to later rounds. I love Spence's "pitchability" and would love to see the Reds take a chance on him with a later pick. He lacks dominating stuff, but knows how to pitch and has success doing it. FINAL THOUGHTSWell, it's about time for draft day, so time for some final thoughts. I'd love to see the Reds land Chris Sale or Austin Wilson (in that order) with the 12th overall pick. If those guys aren't there, then I'd love to get an impact bat like Josh Sale's. I'm not sure how or if Reggie Golden or Ryan LaMarre will be available to the Reds, but I'm very high on both and would love to see them in the system. It's unfortunate that the Reds didn't churn enough players to generate supplemental round picks. Additionally, a guy like Josh Spence intrigues me in the later rounds. Anyway, that's how I see it. As always, it should be fun to see how it shakes out. The Reds could use a good draft to continue it's renewed player development efforts. It's a difficult draft to forecast for the Reds, as after the top 3 picks it's pretty wide open. You have Bryce Harper, Jameson Taillon, and Manny Machado widely regarded as the top tier, but after that there's a lot of dispute and uncertainty. So, determining who will be there when the Reds select at #12 is a bit of a challenge, because it could be any number of players. But, I'll assume that those top three are off the table, so I won't spend time on those guys. As a result, I'll just cover a few arms of note in this post. Cole is a Florida high school student and one of the top pitching prospects in the draft. He stands 6-5 and weighs in at 190 lbs. He bats right and throws right. Cole features a fastball that sits in the low 90s and reaches 94. He also has a good curve/slurve, which sits in high 70s. He also works on a change-up, but doesn't rely on it much. The defining characteristics of Cole are his long, lanky build. He has good size and physical projection, but his arm action is lengthy and while his build allows for additional physical projection, it also may not be sufficient to handle the rigors of pitching every 5th day. McGuire stands 6-6 and weighs in at 218 lbs. He has a 90-92 mph fastball that he commands rather well. He throws a slider, curveball, and changeup. McGuire is a strike thrower, but his upside is somewhat limited. He projects as more of a middle of the rotation pitcher than an elite starter. McGuire strikes me as being similar to Tampa Bay Ray Jeff Niemann. A solid starter, but short on the stuff needed to be an elite pitcher. Allie possesses one of the most electric arms in the draft. He runs his fastball up to 98-99 mph and throws a slider that sits in the high 80s. You simply don't see many sliders that reach almost 90 mph, which makes it a very electric pitch. He also toys with a change-up that sits in the 85-87 mph range, but it's got a long way to go. He also has a very good frame for a pitcher. He stands 6-4 and tips the scales at a solid 225 lbs. Despite the electric arm, Allie's value is dragged down by control problems. His mechanics are fairly clean, but there is some effort and inconsistency in his delivery. Allie has the type of upside that could make him a top of the rotation pitcher, but he also has the rawness that could land him in the bullpen. So, he brings both high risk and high reward to the table. Whitson hails from Florida and is notable largely for his low 80s slider, which grades out as one of the best offspeed pitches in the draft. He stands 6-4 and weighs in at 190 lbs. He bats and throws from the right-side. His height enables him to work on a downward plane and his fastball runs up to 95, but sits in the 91-94 range. In addition to his slider, he also features an 80-82 mph change-up. As for his mechanics, he is somewhat stiff and throws from a rather upright position. Additionally, he has a somewhat unusual arm swing, as he drops it straight down after breaking his hands, which gives him a somewhat herky-jerky look to his arm action. That said, he also has a good arm slot and a fairly clean arm action. He takes a big, strong leg kick, but doesn't seem to efficiently utilize the potential energy he generates. He also uses a shorter stride, which limits the leg drive and cuts off some of the momentum to the plate. As a result, there is a bit of effort to his delivery and potentially a bit more stress on the arm. Whitson has good athleticism, solid/average control of his pitches, and significant upside. Overall, he's an intriguing prospect and should come off the board quickly. 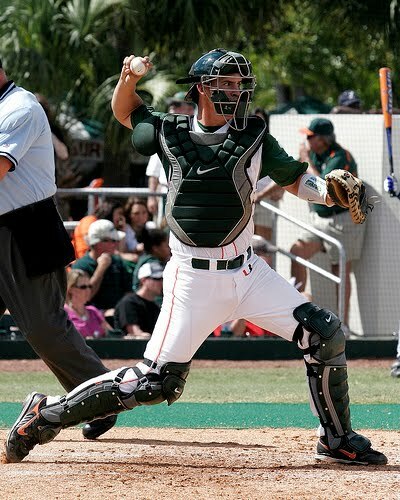 Yasmani Grandal is a junior at the University of Miami, where he bides his time donning the tools of ignorance for the Hurricanes. He stands 6-3 and tips the scales at 210 lbs. He's a switch hitter who, obviously as a catcher, throws right. After two solid, but not spectacular seasons for the Hurricanes, Yasmani took a big step forward as a junior in 2010. This year, Grandal has a stellar slash line of .417/.543/.743 in 206 ABs with a 34/55 K/BB ratio, 23 doubles, and 14 homeruns. Obviously, he's had a very strong, breakout season as a junior, which has vaulted him into the top half of the first round of the 2010 draft. As of late, he's been linked to the Reds at #12 and the Royals at #4. Grandal has made a few adjustments to his swing, which has driven the improvement in his production. He has tightened up his swing and taken some length out, which gives him a quicker swing path to the ball, but questions about his bat speed persist. At the plate, Grandal hits from a widespread stance with a very high back elbow. He takes a short stride to transfer his weight and throws the head of the bat at the ball effectively. Obviously, getting good extension isn't a problem with his longer type swing. However, he has a tendency to extend too early in the swing and also gets out on the front foot too early, especially on good offspeed pitches. Grandal has solid power and controls the strikezone effectively, but his overall "hit tool" is questionable. He struggled in his stint with Team USA last year and has struggled with consistency in his switch hitting. I love the walk rate and ability to control the zone, which allows him to select a pitch he can handle, but I'm not convinced that he can effectively drive the pitch when he gets it. On the defensive side, questions remain about Grandal's arm strength and accuracy. Additionally, he doesn't have the best lateral movement and needs to polish his footwork, as it impacts his ability to quickly get into throwing position to nab would be basestealers. Grandal has solid receiving skills, but needs to continue working on his skills to become better than league average defensively. Overall, Grandal is solid-average behind the plate and should have no trouble remaining there at the professional level, which gives his total prospect value a boost due to positional value. Overall, I'm not in favor of the Reds drafting Grandal. For me, just too much of his total value as a prospect is made up of positional value. Grandal falls short of total value provided by the top tier of catchers of recent drafts, including Matt Weiters, Buster Posey, and Tony Sanchez, and to me his rumored draft position speaks more to the lack of impact talent in the draft class than his true value. I'm just not convinced that he projects as an above average MLB catcher, as I have questions as to whether his swing will translate to wood bats and the professional ranks. Additionally, his defensive skill set is questionable and his arm strength and accuracy is average at best. Catcher is a challenging position to fill, as in the NL without the DH catchers can only contribute in 130 games. As a result, the differential between league average and the top tier of catchers is smaller than for other positions. To me, if you are burning a first round pick on a catcher, it needs to be one of the Buster Posey or Matt Wieters vintage. There are too many wrong turns on the catcher development path to burn a 1st rounder on a prospect with significant question marks. To me, the Reds should be draft the "best player available" and I just don't see Grandal as being that guy. I'd love to get him with any pick other than our 1st, but that's not a possibility. For me, there are simply too many other prospect who offer a better combination of risk/reward to justify grabbing Grandal. 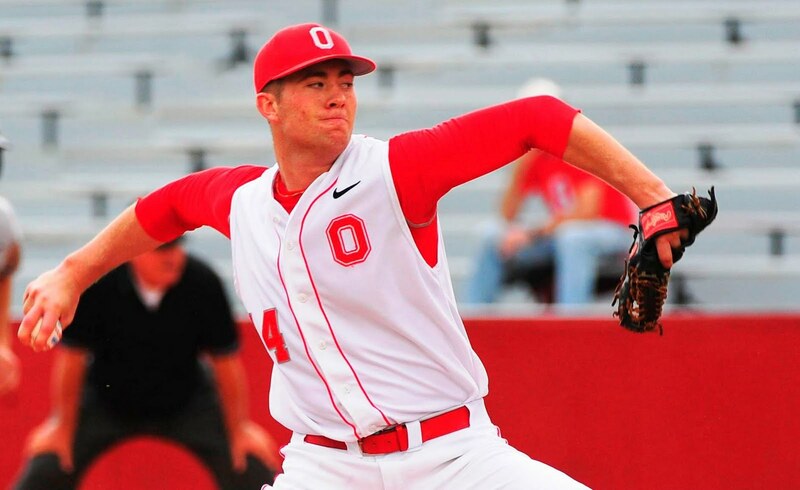 Alex Wimmers is a junior from Ohio State University and one of the best collegiate pitchers in all of college baseball. He stands 6-2 and tips the scales at 195. He bats from the left, throws from the right, and is from Cincinnati and attended Archbishop Moeller High School. In 2010, he posted a 1.60 ERA, 1.11 WHIP, and a 86/23 K/BB ratio. Wimmers has made 10 starts and has a stellar 9-0 record. On the season, he's given up 58 hits, only 9 of which went for extra bases and he hasn't given up a homerun the entire season. Obviously, that's pretty impressive considering the power generated by the metal bats in the collegiate. His performance in 2010 was enough to earn him a second straight First Team All America honor. Wimmers works with a three pitch mix. He features a 88-92 mph fastball, a solid curveball that sits in the low 70s with an 11-5 break, and a potentially plus change-up that sits in the mid-70s. His stuff doesn't overwhelm, but he commands it well and effectively pounds the strikezone. He's the type of polished pitcher who gets the most out of his abilities by not giving anything away to the hitter. He has a good understanding of how to pitch and really owns the mound when he works. Wimmers uses clean, efficient mechanics. There isn't much wasted movement in his delivery. He starts his windup with a step towards first base, which transfers his weight and enables him to shift down onto the rubber with his right foot. He then brings his left leg up into his leg kick, which comes up well past parallel. He also incorporates significant hip rotation into his windup. The differential between his hips and shoulders creates tension and torque to impart on the baseball. Both the leg kick and hip rotation operate to create and store significant potential energy to unleash as he comes to the plate. At the apex of his leg kick, Wimmers maintains good body control and stays balanced over his plant leg, which enables him to effectively gather his momentum for the drive to the plate. 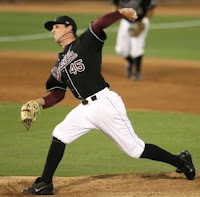 Wimmers get a strong push off the rubber and incorporates a lot of leg drive in his delivery. This should reduce stress on the arm, as he doesn't have to generate all the velocity with his arm. The aggressive push off the rubber and strong lower body drive results in Wimmers using a very long stride to the plate. Wimmers' aggressive stride to the plate really gets him extended, which occasionally causes struggles getting out over the top of his stride leg. The result is Wimmers seemingly throwing against his stride leg. The extension created by his longer stride also results in Wimmers really bending over at the waist and his right leg really whipping around in his follow through. At one point, Wimmers' right foot is well above the rest of his body. The strong rotation of his hips really pulls his arm down and through, which frequently carries his momentum around and causes him to fall off to the first base side, leaving him in less than ideal fielding position. As for arm action, Wimmers' is pretty clean and quick. He throws from a three-quarter arm slot and his arm maintains good position throughout the delivery. His arm maintains good relation to the shoulder and is up in the proper position when his stride foot hits the dirt. There really any red flags to his arm action. Wimmers' has pretty clean mechanics, but he does have some effort to his delivery. He has a quick arm action, a quick tempo to his delivery, and a lot of lower body drive, all of which works to generate generate energy to impart on the baseball. However, while he throws effectively with his entire body, he does seem to be pretty well maxed out. The tempo of his delivery, the strong lower body drive, and the longer stride maximizes the output of his mechanics, but that means that there just doesn't seem to be much projection left in his arm action or pitching mechanics. Additionally, his physical build doesn't lend itself to much additional projection. Overall, Wimmers is a polished, lower risk, lower ceiling type of prospect. The Reds took a similar profile pitcher last year in Mike Leake, but Leake is proving that both his polish and upside were potentially underrated. Wimmers isn't likely to move as quickly or perform at such a high level. Wimmers might intrigue the Reds, in part because he's a hometown kid, but his upside doesn't seem high enough to justify the Reds selecting him with their first round draft pick. Personally, I'd rather see the Reds target a prospect with more upside, even if it necessarily comes with higher risk. Wimmers certainly looks solid and his intangibles are very strong, but I'd like to see the Reds sight their sites on something better than solid, especially in the first round. You don't get many chances to add high upside, potential impact talent in the draft and the Reds have enough depth in the farm system to justify rolling the dice on a higher upside, higher risk prospect.